Yes, I’m still posting things from my trip to the South. Deal with it. Cities Cupcake is in Knoxville, TN. While there, I met with someone I presumed to be the owner, Linda Hurst. She was very friendly and fun to be around. The baking staff was trying out a recipe for a squash cake, for a potential cupcake in the future. The cake was sweet (but not too bad), and very, very moist. A few suggestions for the name were bandied about (I suggested Plymouth Rock, since, ya know, the pilgrims must have eaten squash). A big debate was what the frosting should be (I suggested a simple meringue- light and fluffy, and preferrably lightly toasted… Linda and the other staff thought that could be a lot of fun, but there would need to be a training session for how to use the torch effectively and safely). 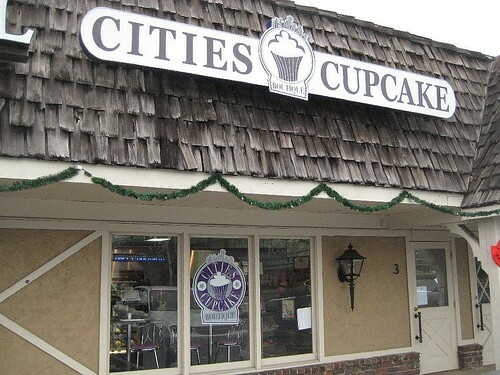 Anyways, the whole concept of Cities Cupcakes is rather unique. Each cupcake has the name of a city, and each cupcake is supposed to be representative of the city it is named after. The Santa Fe is the perfect example: a jalapeno cornbread cupcake, covered in cream cheese frosting. YUM! While there, I had the good fortune to try the Charleston (which I believed was the Savannah, for some reason). 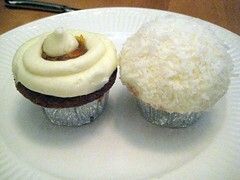 The Charleston is a coconut cake with cream cheese frosting and topped with shredded coconut. Whew… how was it? Well, the coconut flavour was GREAT, but the cake was very dry. So dry it crumbled and I had to pick up little pieces. Overall, it needs some work. I also tried the new Half Moon Bay. I’ve never heard of Half Moon Bay, but apparently it’s in California, and holds a gigantic pumpkin festival. I like pumpkin. I don’t know how I never heard of this… anyways, the cupcake was very delicious. Pumpkin cake, with cream cheese frosting, and a bit of orange marmalade thrown on top for good measure. This cupcake was slightly dry, but had some explosive, intermingling flavours that I really enjoyed. I’d have it again, for sure! I also tried the Knoxville Mocha; an espresso drink with rich chocolate syrup, orange flavouring, whipped cream, and orange sanding sugar on top. Overall, it was WAY too sweet, but the combination could have been life-changing. When I ordered it, Linda was very excited to make the drink, and I think it may have been one of the first times they used their espresso machine. If the proportions of flavours are altered, this could be a winning drink, but until then, be forewarned! Each cupcake is $3 (so, a bit pricey, I think). 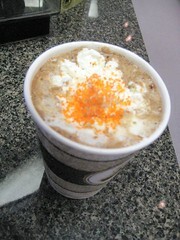 I forget how much the mocha is, but it’s safe to say it is around $3.50 (a pretty average price, I’d say). Go to Cities Cupcake, and tell me what you think! !